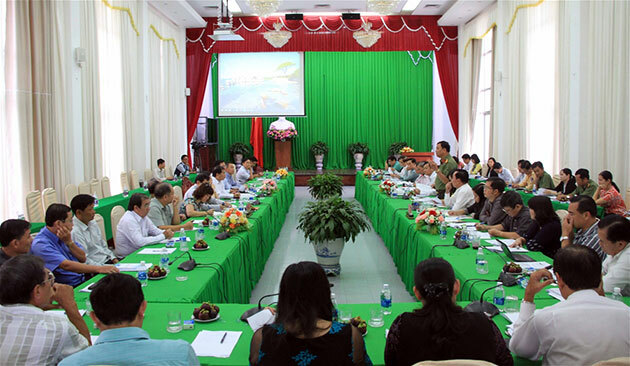 The Mekong Delta city of Can Tho has set forth plans for cooperation with ministries and agencies to make the High-Level Policy Dialogue on Food Security and Sustainable Agriculture in the locality from August 21-25 a success, according to a municipal official. Dao Anh Dung, Vice Chairman of the Can Tho city People’s Committee, said at a working session with the APEC 2017 National Secretariat on July 18 that Can Tho regards the event as an opportunity to promote trade and local tourism. There will be 15 meetings, seminars and conferences within the five days, of which the ministerial-level meeting will bring together leaders of global economies and over 500 other delegates, he said. Dung noted that the municipal Department of Agriculture and Rural Development has been assigned to coordinate with relevant agencies in organising events in localities with attention paid to communications work, security, food hygiene and safety, trade and tourism promotion and technological applications in the farming sector. Through fairs, exhibitions and tours, Can Tho is expected to motivate participating foreign businesses to engage in cooperation with those in the Mekong Delta, the official said. Speaking at the working session, Deputy Foreign Minister Bui Thanh Son, head of the APEC 2017 National Secretariat, praised Can Tho for its thorough preparations for the dialogue. He said enhancing food security and sustainable agriculture, and climate change combat is one of the four cooperation priorities of APEC 2017’s agenda, along with promoting sustainable, innovative and inclusive growth, strengthening regional economic connectivity intensively and extensively and improving competitiveness and innovation of small- and medium-sized enterprises (SMEs). This is also Vietnam’s initiative which has received high consensus of other APEC members, he said, adding that the dialogue is expected to bring pragmatic interests to Can Tho, which has been seen as a locomotive of the Mekong Delta – a key region in agricultural development and climate change response, Son said. He urged Can Tho to place importance to the communications work to raise awareness of the business circle about the dialogue, explaining that businesses are the main factor contributing to the success of the event./.